Lights, camera,action....Pro Bono Australia subscriber organisation recounts the success of its video project donated by Westmedia in 2009. Australian-based overseas aid organisation, Global Concern is still counting the benefits from its successful association with West-Australian film production company Westmedia after it saw an article offering assistance in Pro Bono Australia News in 2009. Global Concern responded to Westmedia’s invitation for a Not for Profit organisation to apply for a pro bono video project as part of the companies way of giving back to the community. 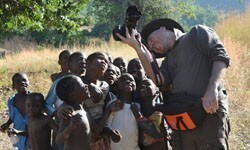 The result is a 5 minute compelling and often confronting documentary about the organisation’s work in Malawi, Africa. The film has been produced into a DVD for donors to raise awareness and is also on Youtube. Global Concern’s Development Manager Justin Franks says the whole project was a great experience and Westmedia produced a very high quality video. Franks says the video has certainly helped to raise awareness of their cause as an aid agency overseas. Global Concern exists to provide assistance and training to people in developing countries in obtaining the skills necessary for sustainable development of themselves and their environment. By this and emergency relief in times of crises and disaster, they hope to alleviate poverty. to companies here in Australia. Westmedia Producer Tony Turner says he understands the significant funding hurdles faced by many organisations particularly in the areas of marketing, promotion and information and believe it is in this area that his company can actively participate. Westmedia donates one video project per year to the Not for Profit sector and applications are now open for 2010. The selected organisation should have a compelling message, know its audience, and have definite plans for how the production would help their organisation. Westmedia is looking for powerful stories so that the video will have a real impact and make a difference. Westmedia is based in Perth, Western Australia. Its clients include Rio Tinto, Bankwest, and Paladin Energy. The directors are Mark Zollweg and Tony Turner who between them have around 30 years Film/Television and Design experience, both here and overseas. Turner says Westmedia would like to continue participating in supporting efforts that serve the needs of its community and beyond. He says it has the responsibility, as well as the resources, to improve the public good. If you believe your organisation could benefit through the production of a marketing, promotional or informational video you to provide a brief proposal. This would outline what the subject is, the desired time frames, and the proposed target market for the video. Westmedia says it will consider projects from across Australia or overseas with the logistics of travel to be worked out as part of the proposal. Please send your proposal in either Word or PDF format to: probono@westmedia.com.au before the end of Feb 2010.